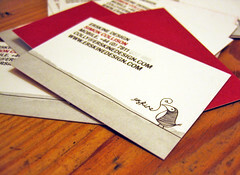 Simple but hopefully effective new business cards, reflecting some elements of the forthcoming website redesign. Each person has their own bird on their card, with (voice of Patrick Bateman) hand-drawn line and watercolour splosh, and details in our new favourite typeface. Plain "Erskine Red" on the back. Lovely work from our old friends at Funnel Creative, Manchester.